Scans of the final chapter are available here. It was rushed! Much more than Tsubasa and XXXHOLiC were! But I feel like this was the best CLAMP could do under the circumstances they had. I feel like Kobato. could have been much greater, development-wise speaking. I feel like it wasn’t supposed to be only 6 volumes long. It ran for almost 6 years and it only had 6 volumes. Kobato. was very damaged because of its publishing issues. Though never officially revealed, something didn’t work out during its days at Sunday GX, and after some months in hiatus, it moved to Newtype under its 14 pages limitation (since Newtype is first and foremost, an anime magazine). The story went back a few steps before continuing from where it was left out, and it looked promising, it even got an anime adaptation with only 3 volumes published and still rather unknown. Being a CLAMP title, maybe they bet the anime would be popular regardless of the manga sales (because Kobato. never sold well enough for a CLAMP title). Maybe they even bet it would increase the interest over the manga version. But the anime ended, the manga kept going for another year, and maybe there was nothing else to be done. Yes, I am considering here the possibility of the manga being canceled earlier than CLAMP’s original plan. There were a lot of sub-plots there weren’t explored well enough, I am talking about the creatures, the Mihara family, Sayaka and Okiura’s relationship, Doumoto, to name a few. The main plot itself – the girl who heals wounded hearts – seemed more promising than it actually was… I don’t know why Kobato’s bottle has that size if CLAMP’s original plan was for her to get this little amount of drops. I thought the reincarnation resource is being way too much used by CLAMP, so is the “waiting x years in order to be happy with your loved one”. We’ve seen that in RG Veda, Wish and more recently in Tsubasa and XXXHOLiC. It was cool and different and it worked well with RG Veda, but now it’s getting overused. Before that, we’ve seen the “stopped time” plot in Tsubasa/XXXHOLiC, seeing it again in Kobato., so shortly after, feels like plot recycling, and I really don’t like that plot device very much (it doesn’t make much sense to me the stopped time thing!! xD). I am quite unhappy with this ending, but not only the last chapter, because a chapter is a chapter, you can’t blame the ending just because of the final chapter. I am looking at the big picture here, the story as a whole and how it felt unexplored. With only 6 volumes (with 160 pages each, less than the average manga volume! ), I think Kobato. should have less characters and less sub-plots to tell its story properly. But not everything is wasted, right? Features a new color page! The first color page for volume 5, if I’m not mistaken? You can download the chapter here thanks to cutesherry! Yes, I’m back with new chapters alerts =D But only for japanese raws. 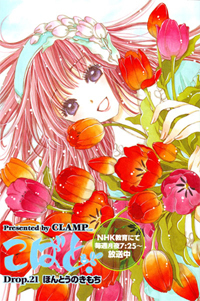 For those who were waiting, the chapter is now available at CLAMP No Lumiere! It’s now available at CLAMP No Lumiere. I would just like to inform you all that Drop. 11 is now available at CLAMP No Lumiere.